While water-cooling the brush tabs gives you the most bang for the buck in terms of cooling performance, the next best thing you can do is to cool the can with direct water contact. I’ve tried a number of different ways to go about this and here’s the method that I’ve elected to stick with. It’s easy, it’s cheap and it works great! - This comes in 12” lengths in various widths. I use ½”, ¾” or 1” width depending on the can size of the motor. 1. Measure the circumference of the motor can around where you will be adding the water jacket. For a Plettenberg 290/30/x it’s right around 5” so I cut a ¾” width brass strip to about 5 3/8” in length. 2. Think about where you want your input and output water tubes to be and then measure and mark the locations on the strip accordingly. Drill the holes just big enough for the 3/16” tubing to fit through them and then, since you’ll want to install the tubes at an angle, make the holes a bit oblong to facilitate this. - Why install the tubes at an angle? Doing so will allow for easier (faster) entry and exit of water to/from the water jacket. Theoretically, it would make sense to angle the tubes in such a manner that the input tube shoots water around the back of the can while the exit tube is angled in such a way that, as the water comes around the can, it leaves in as straight a line as possible. From a practical standpoint, it doesn’t seem to matter. I’ve done a number of tests on this and the only thing that makes a visually perceptible difference in water flow is having the tubes installed at an angle (any direction) in lieu of installing them perpendicular to the can. 3. Anneal the brass strip. - What is annealing? Annealing is the process of heat-treating the brass to alter the size of the brass molecules. The brass will have a darker color tone and will be much more workable (softer) after being annealed. - How do you anneal the brass strip? A butane torch would be the preferred tool, however, I don’t have one anymore so I’ve been using a burner on our gas stove. The idea is to heat the brass until it is glowing red. This will be easier to see if you do this in dim lighting. I use long tongue-and-groove pliers with rubber-coated handles to hold the brass strip as I’m heating it. When the heat treatment is finished, I just drop the strip into an inch or so of water in the sink to cool it. 4. Sand the brass strip. This will provide for better adhesion in some of the upcoming steps as well as making it look nicer. 5. Wrap the brass strip tightly around the motor can. Keep tension on the brass (holding it tightly against the can with your fingers) as it’s being bent around the can. Take your time so that you don’t end up with any sharp bends in the brass. The overlap should continue to wrap around as well. When finished, you should have a smoothly rounded sleeve. 6. Cut two 3/8” lengths off of the 3/16” round brass tubing. A mini tube cutter is the tool that I use for this. I think I paid about $3 for the tube cutter at the local hardware store. These will be the water jacket tubes. Sand them for better solder adhesion in the next step. - NOTE: This step COULD be performed at any time prior to the next soldering step, but I wanted to put it here so that no one else makes the mistake of soldering the tubes into the brass strip before bending the strip around the motor can. Silver solder joints do not bend very well. 7. Solder the tubes onto (into) the holes. Remember, you want the tubes to enter the water jacket at an angle. Make sure that you are using silver solder (plumbing type) and be liberal with both solder and flux. The idea is to attach the tubes and seal the holes with solder. Ideally, there will be little or no protrusion of the tubes (or solder) past the inner surface of the sleeve. If there is some protrusion, you can (carefully) use a file or dremel tool to cut/grind it down. Wash the sleeve to remove any flux. 8. 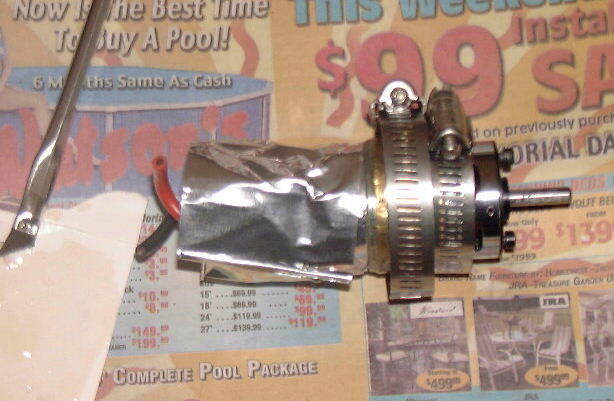 (*** Optional step ***) Place a strip of HVAC aluminum tape, cut to the same width of the water jacket sleeve, around the motor can where you want to install the water jacket. Keep in mind that you’ll want to leave about 1/16” to 1/8” on either side of the sleeve for epoxy bonding of the sleeve to the motor can. - NOTE 1: If you are using a ¾” brass strip to build a water-jacket for a Plettenberg 290/20/x motor, it doesn’t leave much room for the bonding area. I’ve done it, but it might be better to go with a ½” strip or trim a ¾” strip down to 5/8” width. - NOTE 2: I’ve marked this step as optional due to the fact that I don’t see it as absolutely essential. The idea is to protect the can from potential corrosion. I do this on painted motor cans, but not on motors with a chrome-finished can. 9. Cut out two pieces of thin rubber about 1/16” to 1/8” wide and just long enough to fit snugly around the motor can with a bit of overlap. Place these around the can so that the outside edge is even with or inside of the width of the sleeve. Secure them in place with a drop of thick CA on the overlap. These rubber strips will provide the water channel when covered with the brass sleeve. I use some rubber that was left over from installing a Koi pond, it’s about 1mm thick. It doesn’t take much clearance between the sleeve and the can to provide cooling and great water flow! 10. 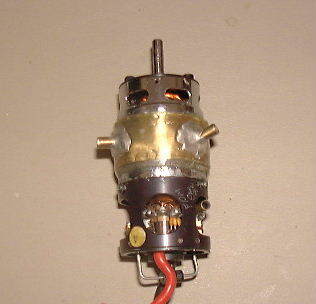 Place the brass sleeve over the motor can, rubber and tape. Position the sleeve so that the tubes are where you intended them to be when you made the decision as to where to drill the holes. Compress the sleeve and secure it with automotive hose clamps on either side of the tubes. Torque the clamps in place rather tightly as this will help to further bend the brass sleeve into a tighter fit. Install another hose clamp down the center of the sleeve (over the tubes if need be). Tighten this up as much as you dare to without causing damage to the tubes. 11. Remove the clamp that is securing the top of the sleeve. 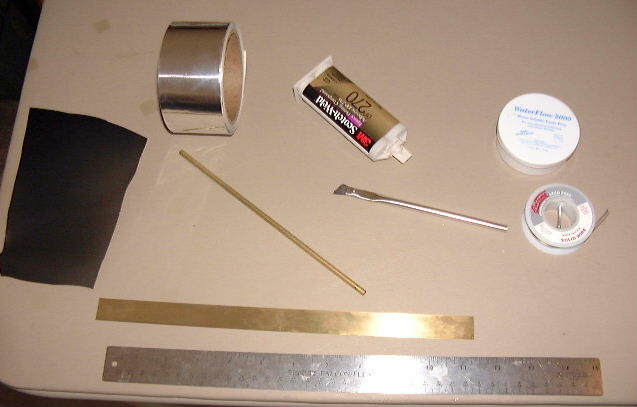 Place a strip of HVAC aluminum tape around the can above the brass sleeve so that there is a 1/16” – 1/8” gap between the tape edge and the brass sleeve. This is your masking for a clean edge when you apply the epoxy. Mix a small amount of epoxy, let it start to thicken up a bit (to prevent dripping), and apply it to the top edge of the brass sleeve and the motor can all the way around the can. Use enough so that when it cures, it will effectively secure the top edge of the sleeve. After the epoxy has setup (but not yet hardened! 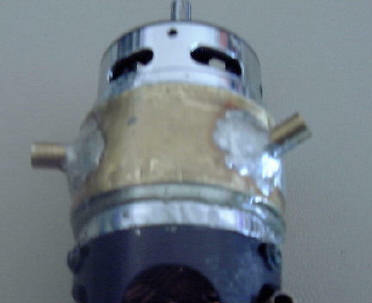 ), remove the tape to reveal a nice clean-edged epoxy bonding of the sleeve to the motor can. Let the epoxy cure completely. - NOTE: I use an acid brush with about 2/3 of the brush cut off at a 45-degree angle to apply the epoxy. If you don’t have any acid brushes lying around, a Q-tip should do. 12. Repeat the procedure outlined in step 11 for the bottom of the brass sleeve. 13. With both the top and bottom of the sleeve secured with cured epoxy, remove the remaining hose clamp from the center of the brass sleeve. Mix enough epoxy to paint the sleeve. Because I can be a klutz sometimes, I’ll usually re-mask the top and bottom with the HVAC aluminum tape. After the epoxy has started to thicken a bit, paint the entire sleeve. Pay particular attention to getting good coverage at the sleeve overlap. Remove any masking after the epoxy has started to setup. Let the epoxy cure completely. This might sound like a lot of work, but it’s really not. Once you’ve tried it, you’ll realize that it’s worth every minute spent on it! Not only will your motor run faster and longer due to the added heat dissipation, you’ll have saved several bucks in the process. Good luck & stay cool!